After a week off (when my work was done by B) I am working Saturday, B’s usual work day, and she is taking the day off. I am still on Pacific time—I left CA about noon, spent 8 hours traveling (including car trips to and from the airports) and got home at 11PM Eastern time—and went to bed 2 hours later, (10PM/pacific/1AM/Eastern) and came to work (some what crankily!) this AM. The Good new about NYC and its transit system, is a 24 hours a day, 365 days of the year operation. The Bad news is NOTHING works 24 hours a day, 365 days of the year. Weekends are often ‘down’ time for the system--but the $64,000 question, is what Lines? and what stations are going off line? In theory, there are notices of schedule changes. In reality, they are so numerous, (and at times so wide scattered) they become background noise. But—157th street wasn’t much use --since there is no free transfer(from the uptown tracks to the downtown tracks) and this week, what with being away, I don’t have unlimited ride metro card-- so I had to go all the way to 168th street (about 3 miles!) out of my way, north, then cross over to the down town side and ride another 3 miles south, to get work. And things being what they are, the Uptown 1 pulled into 168th street just as a downtown 1 was pulling out. And in spite of my lofty ideals, my purple socks are not anywhere near being socks—I have very pretty, somewhat elaborate cuffs, but the prettiest of cuffs are far from being socks! Her TED video was nearly viral (in my set!) a few months ago—and book was as wonderful as I expected. In some ways, nothing in the book was new—and yet everything was! I have slowly learned many of the same things that characterized her insight, but being a slow learner—I recognize I need to be reminded (and to reminded to practice), again and again—to reconnect with my right hand brain. 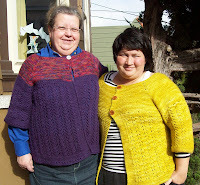 And, finally, because this is, in general—a knitting blog—I’ll end with a bit of knitting. That’s Sonya, in a green (was a total inadequate name for the color!) Malabrigo one, and me in my hand painted mystery yarn and Patons Classic Wool Merino one. You two look great in your sweaters.